Ever since I laid eyes on the original Easywalker Mini stroller, which was followed by Mosey and then an updated version of Mini, I was enthralled. If you're not familiar with Easywalker, it is a Dutch brand, which consistently puts out innovative, high quality strollers and accessories. 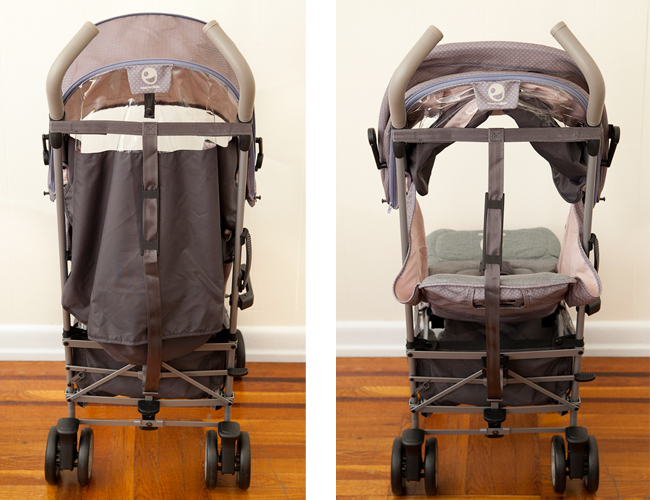 The Easywalker buggy is the brand's newest creation and I'm so excited for the opportunity to try out and review it, thanks to Baby Jungle! 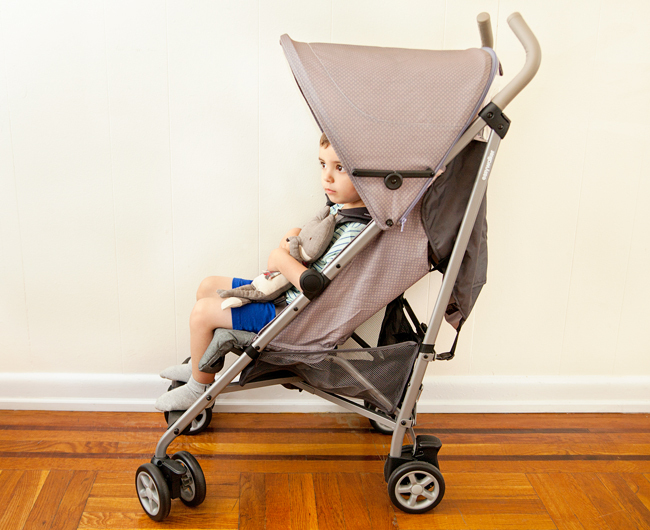 The new Easywalker Buggy was made to turn heads! It is a fashionable buggy that you will feel proud pushing. In the world of utilitarian looking strollers, this buggy stands out with it's refined textiles, beautiful colors and leatherette details. Lest you think this stroller is all about looks, I'm happy to report that it's made with unparalleled child-comfort features. 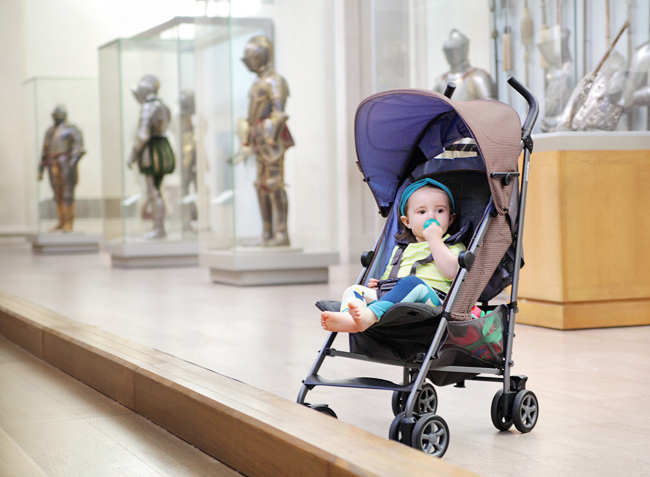 Suitable for newborns and travel system compatible, the Easywalker buggy has all the features you'd want in a compact stroller. 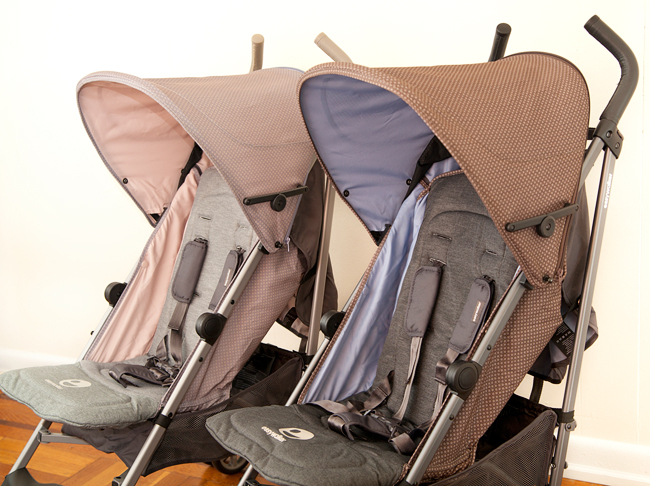 The buggy is available in 6 beautiful colors. I was sent Paris Brasserie and Vienna Cafe for this review. 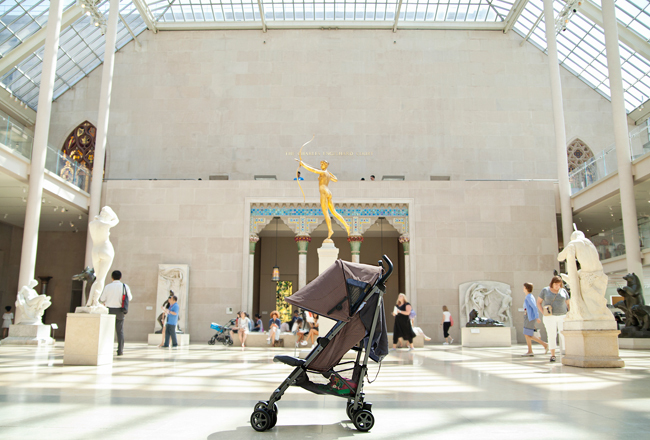 You can see more pictures of the Paris Brasserie buggy from our day at the Metropolitan Museum of Art. The seat on the Easywalker buggy is roomy and tall. 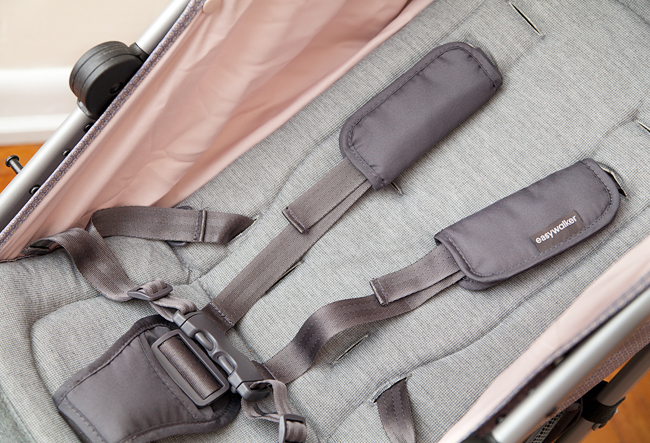 It accommodates children from birth to 44 lbs (20 kg). The seat back measures 19.5" and a whooping 27" inches to canopy! 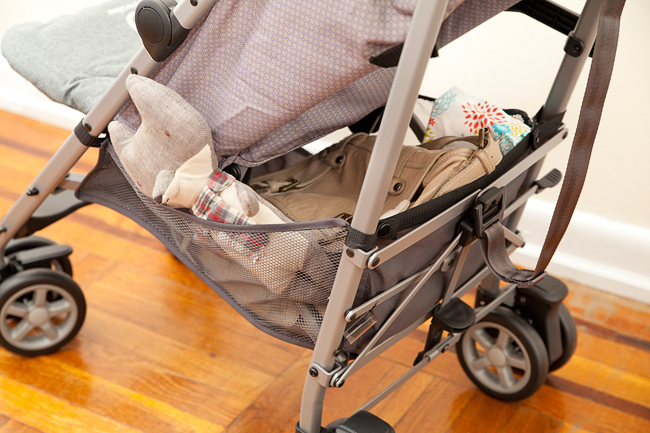 That gives more head room than most strollers on the market, which means even older toddlers will fit into this stroller without having the canopy sitting on their heads. As you can see in the pictures, both Ben (age 3.5) and Abby (otherwise known as Little Missy, age 1.5) are very comfortable in this buggy. The only place where Ben is starting to outgrow it, is in the leg room. The distance between seat edge and foot rest is 8", which is typical of most umbrella strollers. The seat has a one-hand lever recline, which is my favorite type of recline mechanism. It adjusts to 4 positions, including completely flat, making it suitable for newborns and allowing children to stretch out comfortably for naps. The backrest on this buggy is rigid and provides good back support. Many umbrella strollers on the market are made with a hammock-like backrest, which my kids detest. 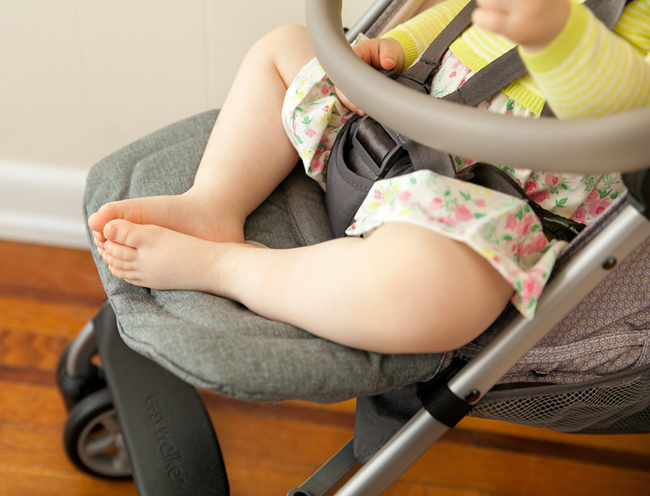 The buggy also features a leg rest. It adjusts via two small levers underneath. When the leg rest is extended, the total sleeping surface is 33" inches. 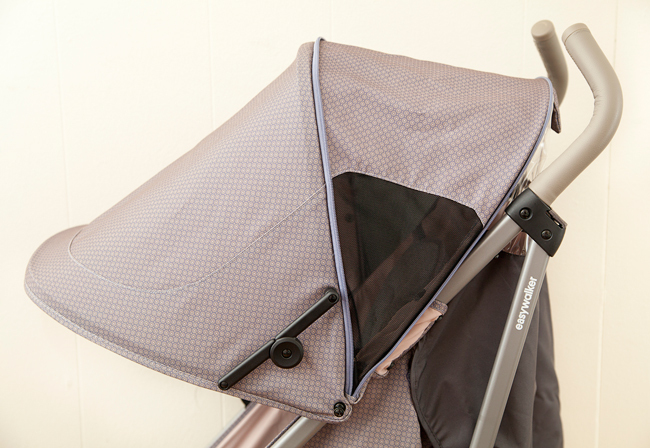 The Easywalker buggy is equipped with an XL canopy. There's an extra zip out portion, and when fully extended, the canopy provides superb protection from the elements. 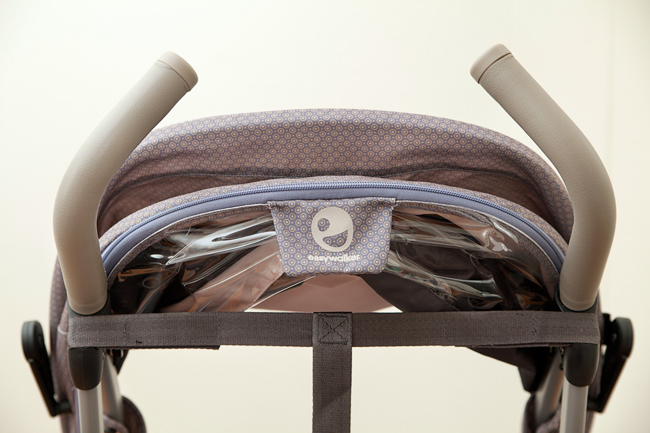 It is lined with the same beautiful pastel fabric as the inner sides of the seat, giving the buggy an extra pop of color. There's a vinyl peek-a-boo window in back of the canopy. It's positioned further back than on most strollers, making it a bit challenging to see the baby when the seat is in the upright position. It's more useful when the seat is reclined. There are also two mesh ventilation inserts for better air flow. The fabric flap in the back of the canopy can be rolled up on a hot day and there's a snap to hold it in place. 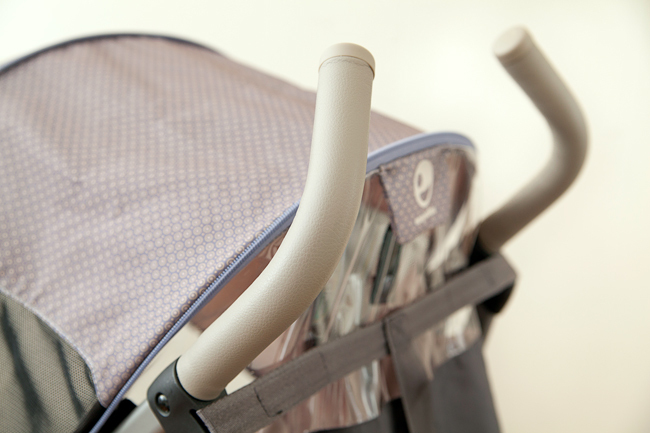 As I mentioned earlier, the textiles on the Easywalker buggy are exquisite! 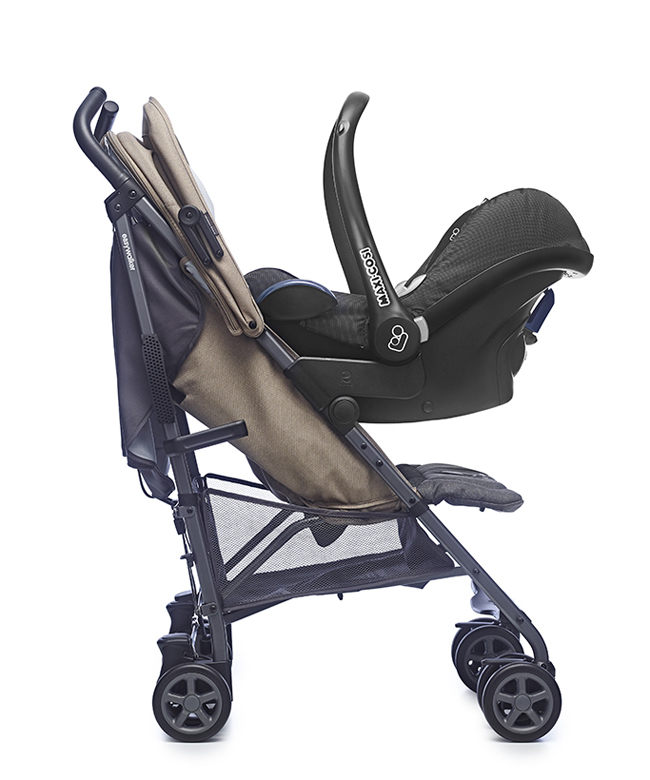 Everything from the stroller outer fabric and seat to the leatherette handles and brushed aluminum frame, exudes quality. 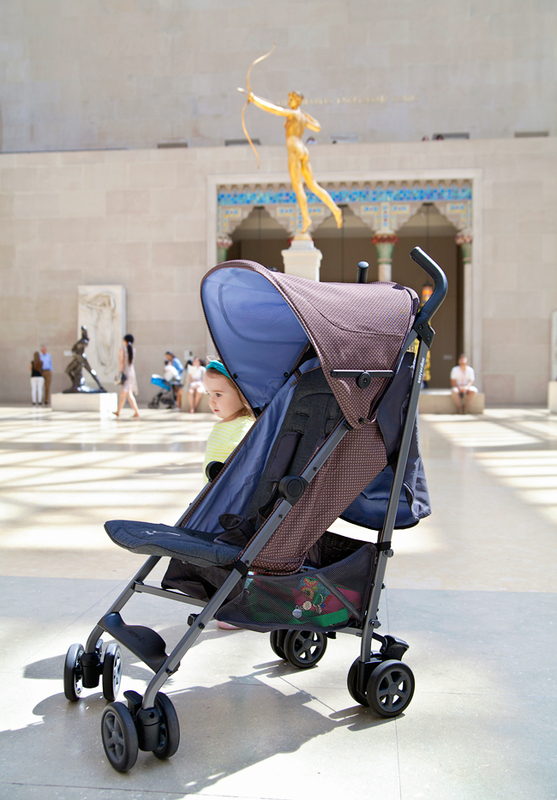 The Easywalker Buggy is available in six colors: Paris Brasserie, Berlin Breakfast, Ibiza Brunch, Milano Melange, Vienna Cafe and Monaco Apero. Each color is so beautiful in it's own way, it's really hard to choose! 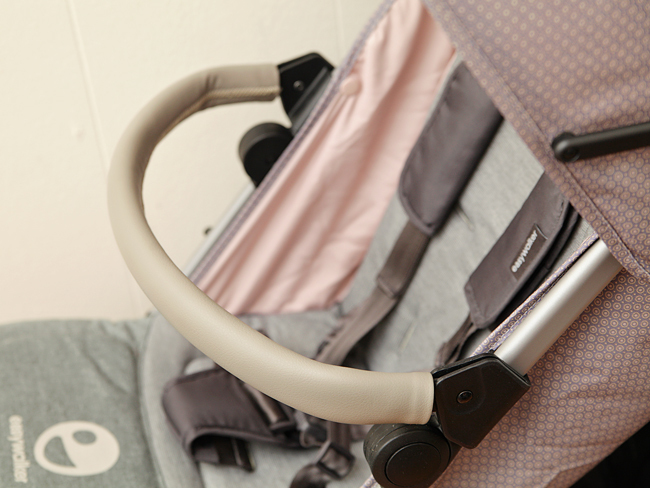 The buggies have either a light grey or dark grey frame, and light grey or black leatherette covered handles. The canopy and seat outer are made of durable fabric in refined colors. The Paris Brasserie and Vienna Cafe also feature a subtle circles print. The lining is made of smooth fabric in complimentary, pastel colors. 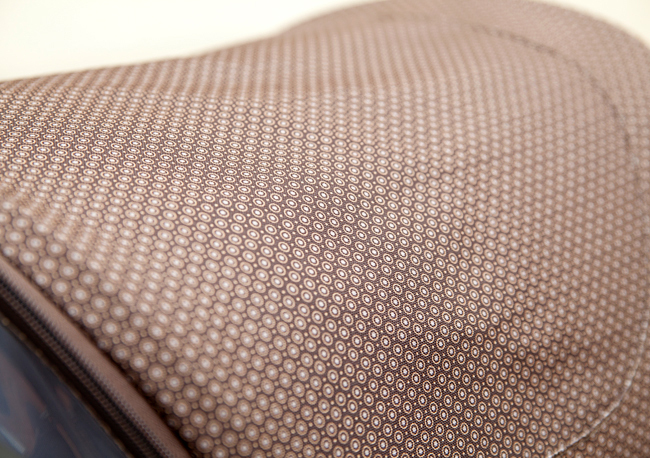 The seat is well padded and covered in softer, cozier fabric. 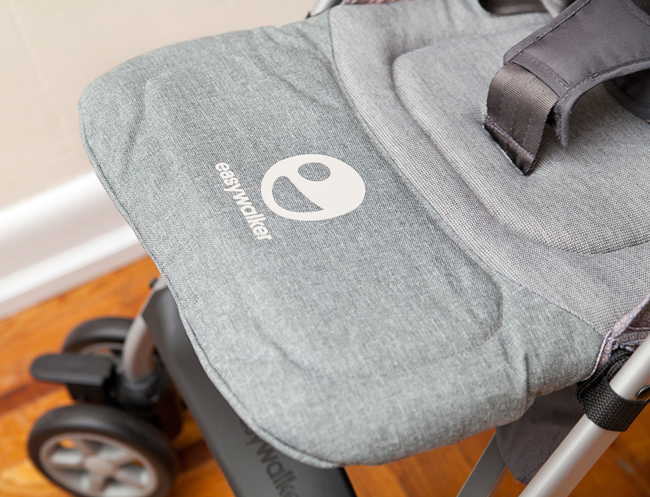 Depending on the outer color of the stroller, the seat is either heather grey, or charcoal. The leg rest is also covered in a more durable, fabric that is easier to clean. Seriously, this is a buggy that you just can't take your eyes off! 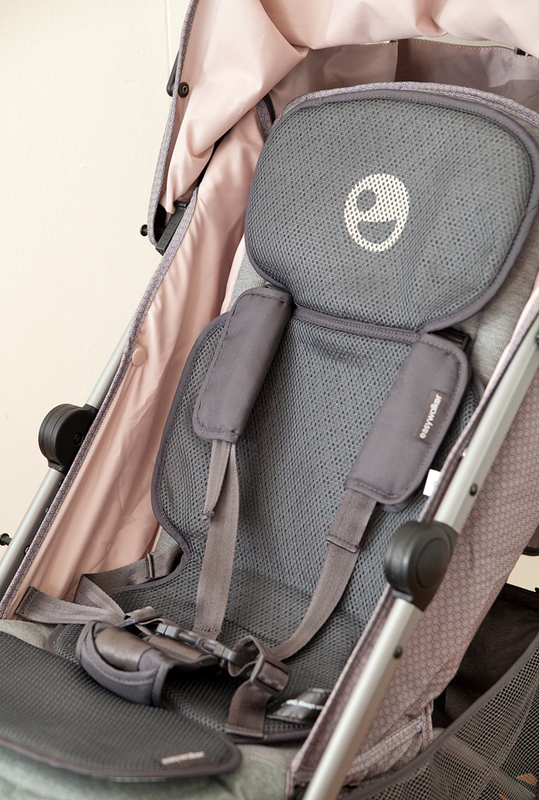 The buggy is equipped with a very user friendly, 5-point harness. The upper straps and lower straps are attached to the same clip, so there's no option of using it as a 3-point harness. 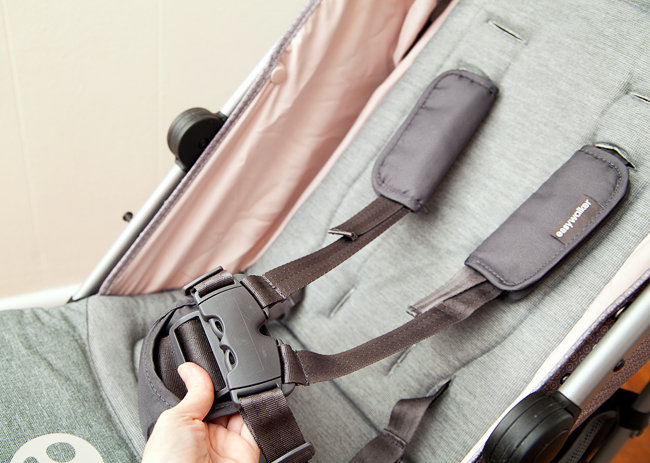 Just like on my Easywalker Mini stroller, which I reviewed last year, the length of the harness is very easy to adjust and it can be done with one hand by lifting up the plastic harness thread peace which is hidden under the shoulder strap pads. The harness pads are attached with small elastic, which prevents them from slipping down. It's a small detail, but it makes a difference! 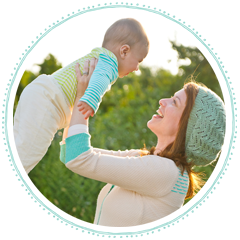 The clasp is very easy to open and close for an adult, yet challenging for a young child. It requires squeezing the clip in two places simultaneously, which young kids are not dexterous enough to do. The buggy rolls along on 4 sets of double wheels with rear-wheel suspension. The front swivel wheels can be locked in a forward-only mode for better handling of grass and mild terrain. 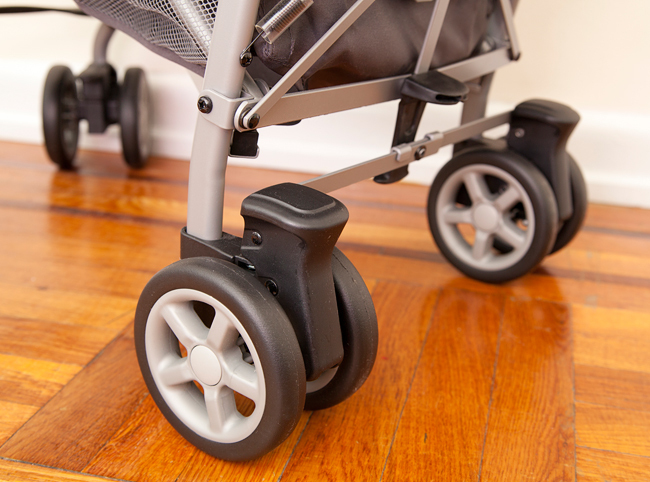 Frankly, the wheels are the only part of this stroller that can be improved upon. 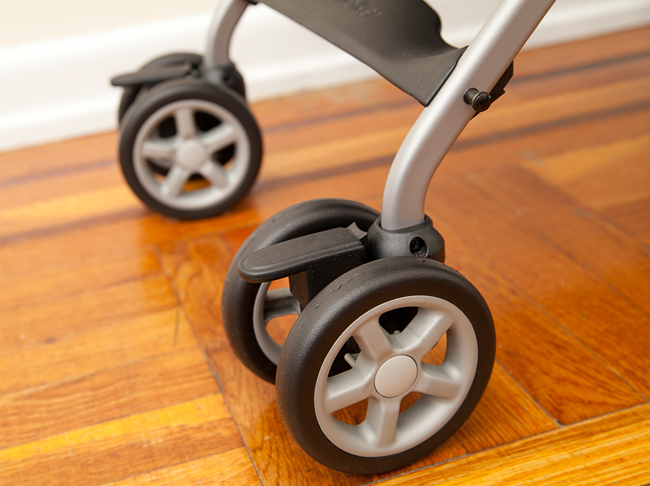 Made out of hard foam and measuring 5" (12.5 cm), these wheels are typical of most umbrella strollers. While there's nothing really wrong with them, I feel that the wheels don't quite live up to the high end feel of the rest of this buggy. It would be really great if the wheels were slightly larger and made of hard rubber. The Easywalker buggy was designed for city use. It pushes very well on smooth pavement and indoors. Anything more becomes a bit of a struggle because of the small wheel size. Steering is best done with two hands. It's possibly to steer with one hand if necessary, but it's not very comfortable because of the horn handles. Those of you who have experience with umbrella-type strollers will know exactly what I mean. This buggy is very stable with good weight distribution. I've hung heavy bags off the handles and the buggy does not tip over. 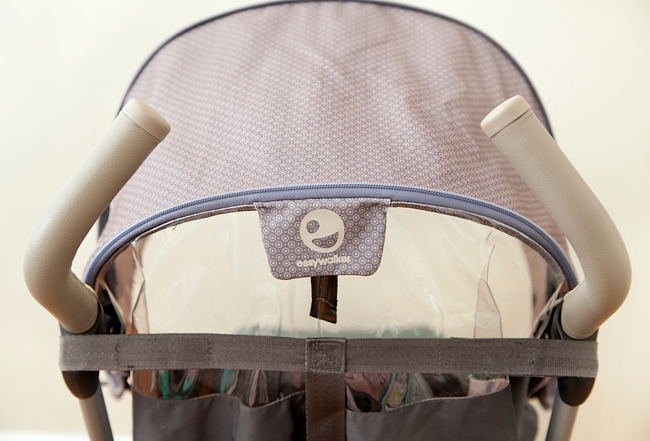 The EW buggy has horn handles, like most umbrella strollers. The handles are covered in leatherette, for a luxurious feel. The very top of the handles is 41.5 inches from the ground. Since I'm petite (5"2), I find the handles to be higher than I'd prefer, but for an average size parent, it should be a perfect height. While the under-seat basket doesn't appear all that big, it's actually decent for an umbrella stroller. It's easily accessible from the back and from the sides. In the pictures, I have my shoulder bag, a pack of baby wipes and Mr. Wolf in there with room to spare. There are two connected break pedals, one on each rear wheel. The breaks are flip-flops friendly, being chunky and having rounded edges. They make an audible click, so you know when the breaks are engaged. The buggy has a typical umbrella-stroller fold, which can be done with your foot and with just one hand supporting the stroller. 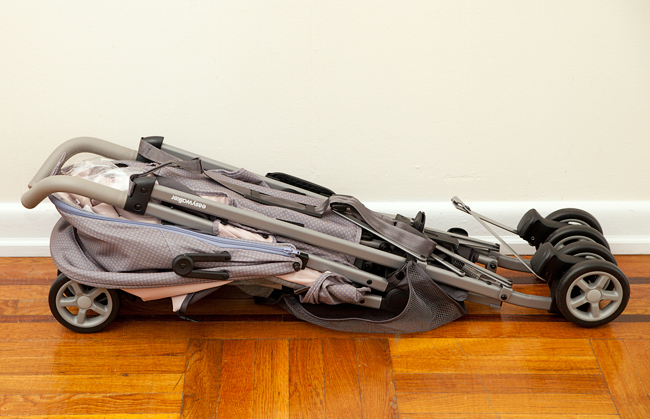 There's an auto fold lock and a carrying handle on one side in addition to a shoulder carrying strap in the back. 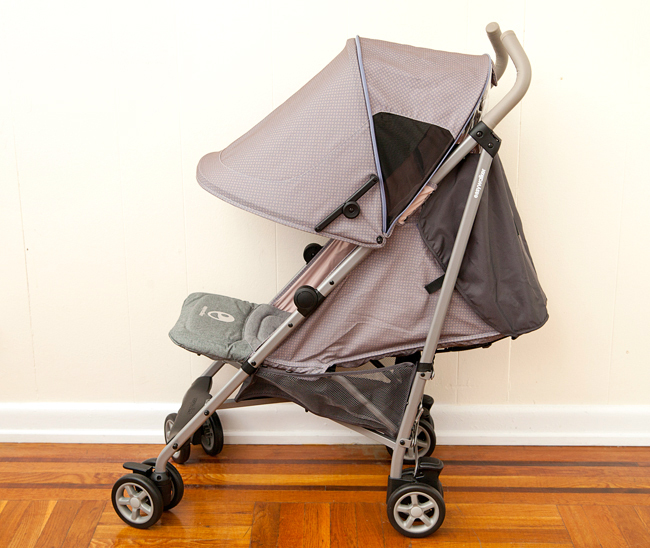 As with most umbrella strollers, the folded stroller is narrow and long. The down side to this type of fold is that the front wheels are resting against the canopy lining. Since it would be a shame to get such a beautiful canopy dirty, and being the crazy lady that I am, I carry along a plastic bag, which I wrap around the front wheels before folding the stroller. 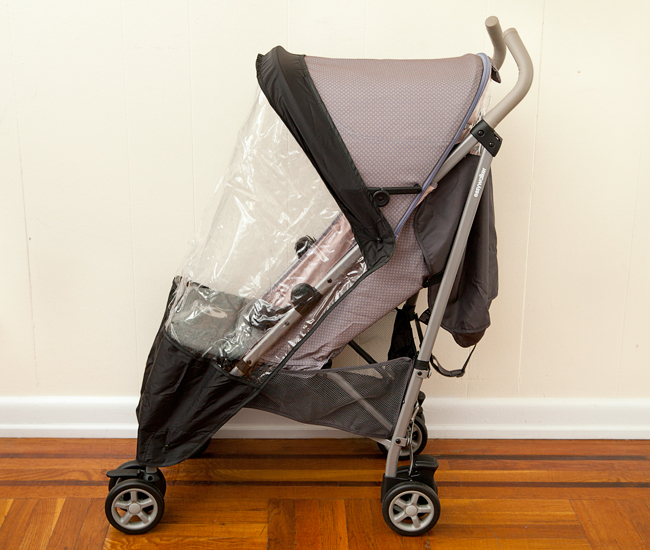 The Easywalker buggy comes with a rain shield included. A variety of other, useful accessories can be purchased separately. Easywalker offers an optional bumper bar for their buggies, available in 5 colors. Just like the handles, the bumper bar is covered in leatherette.The bumper bar does not have gate opening, but it can be moved up or down for easier access to the seat. 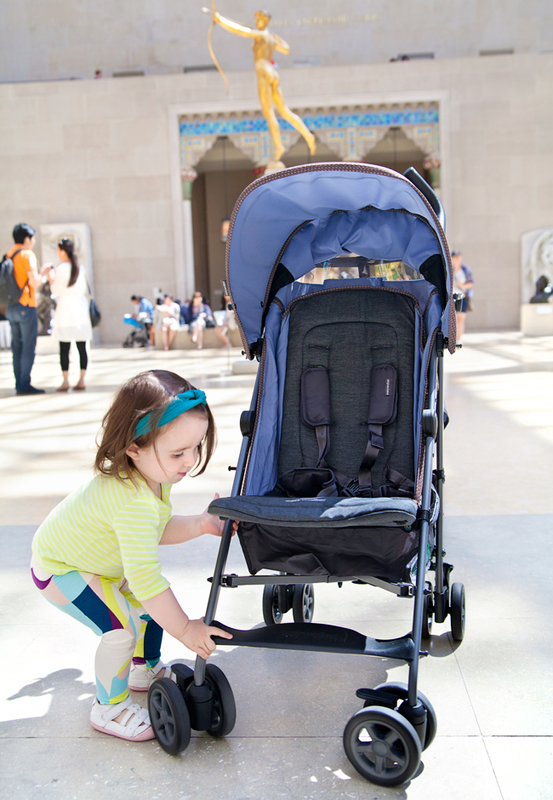 It does not need to be removed when folding the stroller. I was also sent a Summer seat inlay to use with the buggy. 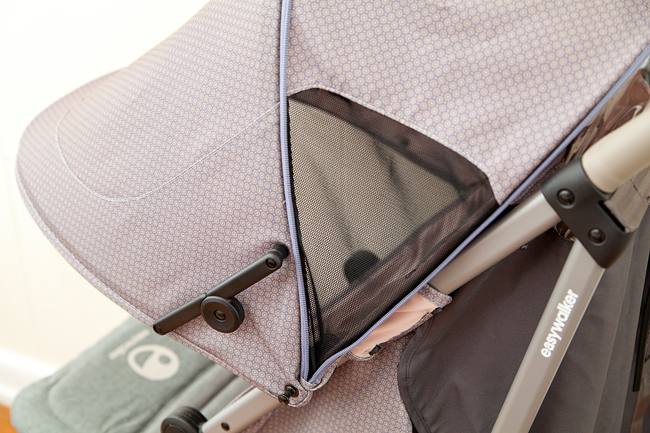 It's made out of 3D air mesh fabric and helps to keep a child from sweating in the stroller on a hot day. Another very convenient thing to have is a parent cup holder. 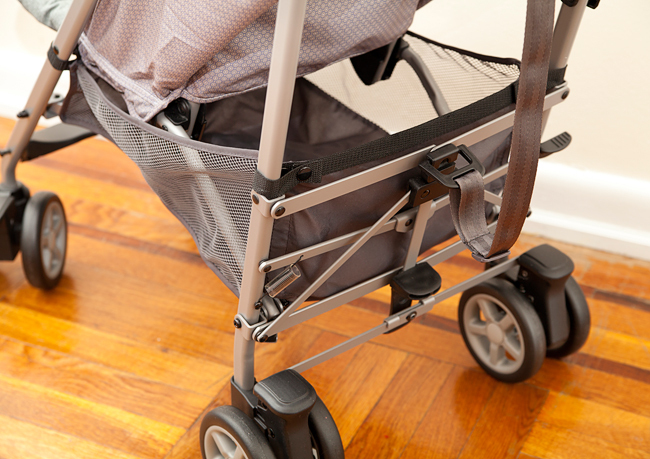 Parents of infants may want to use this buggy as a travel system. 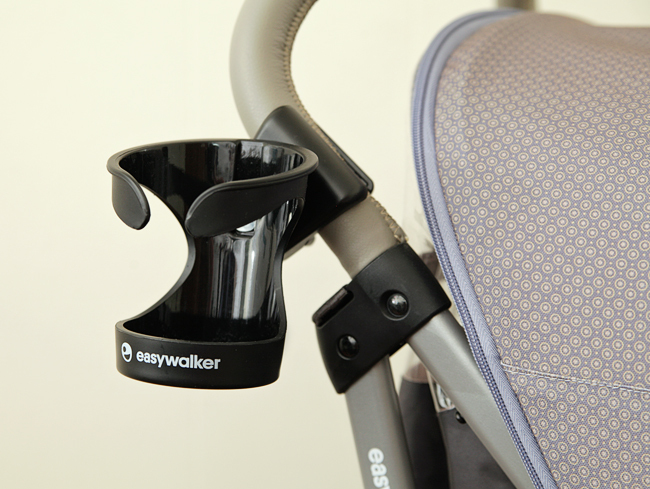 Easywalker makes adapters which fit the following infant car seats: Maxi Cosi Cabrio, Maxi Cosi Pebble, Cybex Aton, BeSafe IziGo, Nuna Pipa, and Kiddy Evolution Pro. 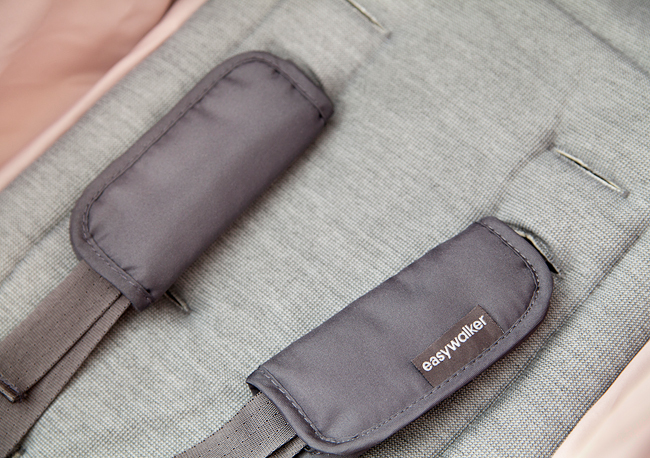 In addition to the above mentioned accessories, Easywalker also offers a travel bag for the buggies, a snack tray, mosquito net, sun parasol, Windshield and a Cocoon to keep baby cozy on cold days. 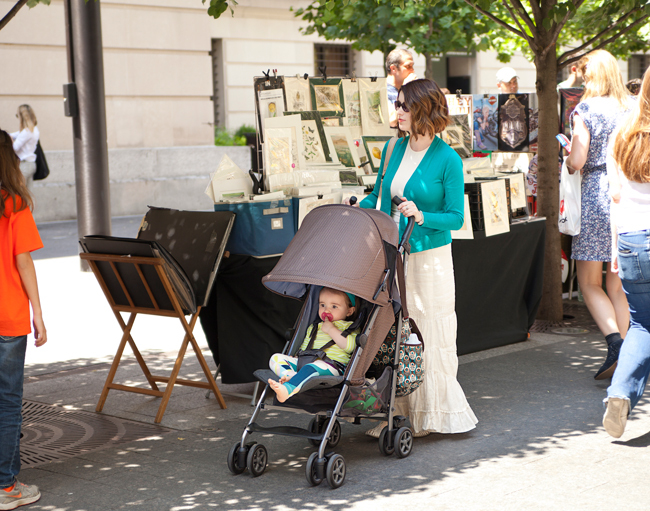 The Easywalker buggy is a luxurious, lightweight and compact stroller, perfect for city dwellers and for travel. 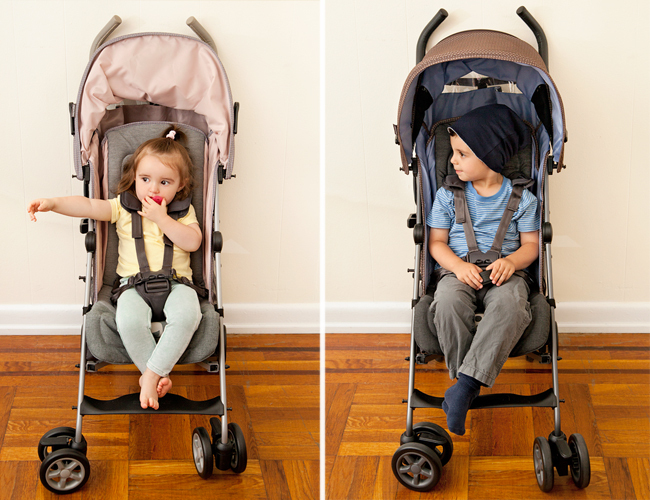 It allows parents to easily navigate in tight spaces and crowded places, while providing optimum comfort for a child. 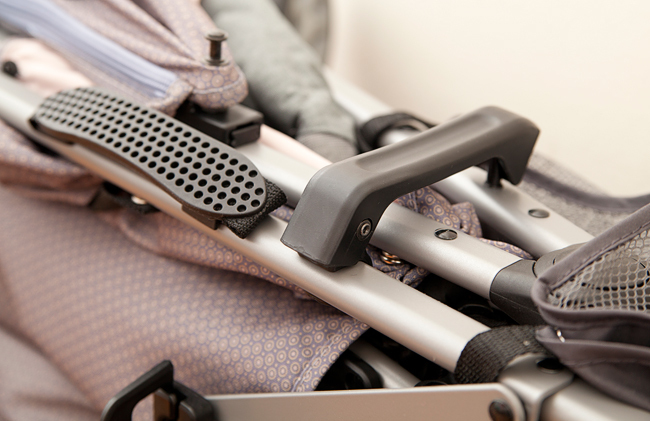 The narrow fold and carrying strap makes this buggy convenient for use on public transportation. The buggy can be used from birth to as long as your kids ride in a stroller, due to a flat reclining seat and ample head room. In addition to all the great features, I think fashionable moms out there would be hard-pressed to find a more attractive umbrella stroller. I very much enjoyed using the Easywalker buggy in the city and it would be my stroller of choice for future travel. The minor drawbacks are really just me being overly-picky and so I decided to give this buggy an overall 5 out of 5 stars rating. 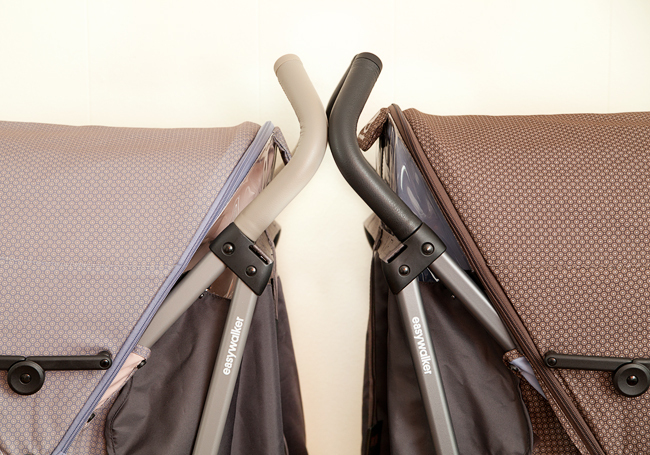 Once again, I'd like to thank Babyjungle.nl for sending these buggies for a review. Baby Jungle is located in the Netherlands and ships worldwide.